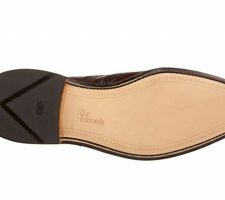 Loake Woodstock Shoes Review - MR ELLIS ! The Loake Woodstock is a gorgeous two-tone oxford shoe. If you’ve been looking for a stylish spectator that can accommodate a wide range of wardrobe uses, the Loake Woodstock should definitely be on your short list. 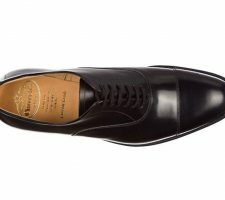 To the discerning shoe enthusiast, the Loake name is synonymous with exceptional quality and rich tradition. Founded in 1880 in Kettering, Northamptonshire (where their storied production factory still sits to this day), Loake has set itself apart from the competition by placing a consistent emphasis on top-notch quality and excellent craftsmanship. 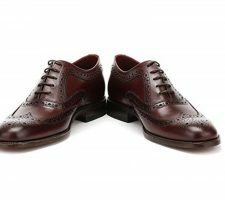 This shows through in practically any pair of Loake shoes that you buy, but for the purposes of this review, I’m going to focus on the Loake Woodstock. The Loake Woodstock is a gorgeous two-tone oxford shoe that features brogue punching along with a combination of both polished and grain calf leathers. The lining is all leather, with cushioned leather insoles that provide wonderful support and comfort. With so many attractive details built into this shoe, it’s easy to see how the Woodstock can complement a wide array of casual to semi-formal occasions (e.g., garden parties, outdoor weddings, weekend outfits, etc.) 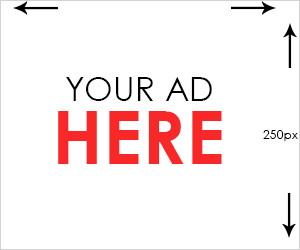 with ample facility. Like any traditional oxford, the Loake Woodstock features a capped toe and a closed lacing system (i.e., the lace eyelet facings are on the underside of the vamp). Being a two-tone or spectator shoe, the Loake Woodstock lends itself to a variety of fashion choices, but when you consider the fact that it is also available in three different colours (black, tan and burgundy), it opens up a world of potential for your wardrobe. The brogue detailing on this shoe is superb, especially on the toe cap. I really like the combination of leathers with varying finishes (grain calf and polished), as this provides an attractive aesthetic boost to the look of the shoe. With such elegant style and exquisite attention to detail on display with this shoe, it’s easy to see how the Loake Woodstock can call to mind the flair and panache of the Golden Age of men’s dress. Simply put, these shoes look stunning, so don’t be surprised if you receive several compliments when you wear them. Loake always sets the bar high in the quality and durability department, and the Woodstock is no exception. There are, however, a couple of key points about the construction of this shoe that need to be mentioned: Number one, the Woodstock features a cemented leather/rubber sole, which is a departure from their typical Goodyear welted construction method. I don’t hold this against them at all, and in fact, I honestly think that people make a bigger deal out of cemented soles versus those that are sewn using a method such as Goodyear welting. Keep in mind that practically all shoe soles are cemented to some degree, whether stitched or not. In addition, the Woodstock is handmade in India instead of the Loake Kettering factory, but the shoes are constructed to the same exacting standards for which Loake is famous. If there is a such thing as insanely comfortable, the Woodstock would definitely fall into this category. As I briefly mentioned earlier, this shoe features cushioned insoles, which will make your feet feel like you’re walking on a pillow. These shoes are surprisingly lightweight and flexible, which is a testament to Loake’s precision craftsmanship, especially in light of how much leather is used in their construction. In addition, the last for the Woodstock is made in a G fitting (a.k.a. wide or 7 fitting), which is perfect for a guy like me who has slightly wider feet. All told, I can honestly say that there isn’t anything I don’t like about these shoes; they fit my feet like a glove, they’re durable and stylish, and they pair quite well with a good number of pieces in my wardrobe. 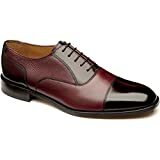 It should come as no surprise that I’m giving a pair of a Loake brand shoes a glowing review. Their quality is hard to match, and for the Woodstock in particular, these shoes have a lot to offer in terms of versatility and range of use. I am personally partial to the tan colour, but the black and burgundy offerings are just as attractive and elegant. The combination of grain calf and polished leather creates a visually interesting shoe due to the way the textures play off one another, and the gorgeous brogue punching adds that extra splash of detail that really makes these shoes stand out. If you’ve been looking for a stylish spectator that can accommodate a wide range of wardrobe uses, the Loake Woodstock should definitely be on your short list.